This morning’s devotion comes from Ron Flowers. How would other “gods” have responded to Pilate? Zeus would have his thunderclap. The Messiah everyone wanted would have called an army down to conquer the Romans. The possibilities for divine extrication are endless, but none would have selected crucifixion. Voluntary, ultimate worldly defeat is not “godly” in the traditional sense. Our concept of higher powers—God or Rome or money—determines our understanding of truth. Nietzsche calls Pilate’s Socratic response to these words, “What is truth?” “the only saying that has any value” in the New Testament. Undoubtedly, Pilate is puzzled by Jesus’ enigmatic “defense.” Betrayed and denied by his followers, Jesus does not even offer any argument for acquittal. Pilate does not wait for, or expect, a response to his question. As a Roman prefect, he has been criticized for his treatment of Jews and Jewish customs. Despite his misgivings regarding Christ’s guilt, to avoid further Jewish unrest and accusations about him to Rome, he seeks the “truth” by turning to the congregated masses. Truth was not objective but only what would serve Roman order and his personal interests. Nineteenth Century Russian painter Nikolai Ge’s painting Quod Est Veritas (What is Truth? ), contrasts Jesus, a ragged vagabond, before stately Pilate, well polished in his finely-folded toga. 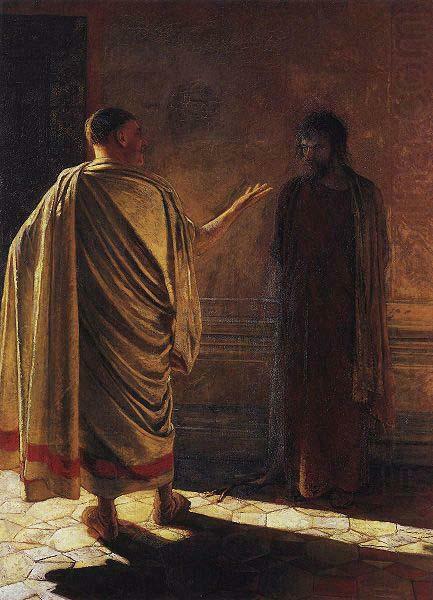 Pilate poses the question Socratically, while already turning from Jesus to the waiting crowd. The light of Rome shines from behind Pilate but does not grasp Jesus, almost void of form, and unreachable to those who are not yet “of the truth,” who cannot listen to his voice. Jesus does not become man to conquer this world. If, in response to Pilate, Jesus and his “servants” vanquished his Jewish and Roman oppressors before ascending to heaven, we would be left with the Law of God, “Be ye therefore perfect, even as your father which is in heaven is perfect.” And, though many religions or theories, including versions of Christianity, do see religion as continuous striving to emulate moral perfection, perfection is not attainable. We require atonement for our sins, so that we may be freed from the condemnation of the Law. The truth is that Christianity is necessarily linked with death. Christ bears witness to this truth, not through his achievements in this world, but through his death on the cross, so that by him and through him, we may be given life by the Spirit that raised him from the dead. As a reminder, if you’ve enjoyed these devotions, or have enjoyed your Mockingbird Devotional in general, we certainly wouldn’t stop you from letting us know! If you feel so inspired, give us a recommendation on our Amazon page, here.